Here at Movers.com, we have done a serious overhaul to the way we do business with you. Our site now features profile pages for moving companies that take full advantage of the multimedia capabilities of the online world. Through photos, video, ratings and reviews, and your written profile, customers will be able to interact with your business like never before, allowing you to stand above the crowd. And best of all, it’s free. Click through the following pages to see more information on the new avenues open to you. This is the all-new Movers.com. Movers.com is all set to woo their customers, both moving companies and visitors, with features that will set a new benchmark for online relocation services in the future. With the new Movers.com, the virtual gap between moving companies and visitors ceases to exist as the new foundation we’ve laid brings them closer together than ever before. Exclusive Profile Page: This page enables you to include your company’s profile, services offered, contact information etc in a very simple text format. And of course, you can do it all by yourself, you don’t need a technical expert to do this. Your Company Pictures: Pictures speak more than words; you can upload the pictures of your company, your movers in action, and any image that can talk more about your services. Free Video: We will provide you a Free 1 Minute video with image montage that can be uploaded to the page. RRR - Ratings, Reviews and Reputation Management: Enjoy the benefit of knowing how your customers rate and review your excellent services. You may respond back to their reviews to maintain a better customer relationship. Create Coupons: You can post your discount or promotional coupons to customers in the printable format here. Phone Calls: You can receive direct telephone calls from this profile page using an exclusive trackable phone number that we provide you. Leads: Get Exclusive Leads from the profile page. Movers.com Trusted Seal: You are our valued member, and we would provide you with a Trusted Seal on the profile page and one for your website too. Packing Materials Shopping Cart: We provide you with a free packing supplies shopping cart for your website and you can make up to 15% in commissions for every order made. Of course we do the leg work for you. COST:FREE! Remember, we said you are our valued member, so you will enjoy all the above exciting features free of cost. NO hidden fees. You will pay only for exclusive leads, shared leads and for phone calls. "Customer is king": As long as this golden rule applies, it should matter that a moving company considers the satisfaction of its respective customers by allowing them an opportunity to voice their opinions. This can also create healthy competition. Considering this underlying requirement of today's online world (that is, the ability to review products and services), Movers.com has implemented a Ratings & Reviews section, wherein a visitor gets a chance to rate and review any moving company. These reviews are constantly moderated by Movers.com. If a user posts a complaint against a moving company, the negative review could hamper their online reputation. On our site, we provide a chance for the moving company to communicate with these customers. If the customer in question feels satisfied with your explanation for or solution to the problem, we neutralize the negative review so that your reputation remains intact. Who better to talk about you than you? Smart moving companies always look out for reputable platforms to present themselves on, in order to reach more customers. Keeping this in mind, Movers.com provides individual moving companies with their own profile pages, wherein they can update their company's history, overview, list of services, and more. This allows for more than just a quick snapshot of your company. A customer interested in doing a little further reading on your business will be provided with whatever information you think he or she should know about you. Been in business a long time? Have an impressive number of collective years of experience under your belt? Received any accolades? This is the place to brag. We don't expect you to be the tech-savvy person; that's our job. And we know you are busy running your business. With this in mind, we at Movers.com are willing to help you get a profile page started with us. Once we help you get the ball rolling, you'll be blown away by how fast it gets going. A picture says a thousand words. A simple snapshot of you doing what you do best is one of the best ways to communicate the quality of services that you offer. Using our Photo Gallery feature, moving companies can upload photos and present them in a visual way, which boosts the customer's confidence. You can upload up to 10 pictures of your office space, employees, equipment: whatever you like. Give the customer a chance to see the enjoyment and dedication you put into your work. Then, you won't just be some text on a webpage. If a picture speaks a thousand words, what would a live action video do? Movers.com provides the opportunity for all of our moving companies to receive, from us, a professionally-produced video to put on their profile page. By filling out a simple questionnaire and sending a few photos, you will receive a powerful marketing tool put together by our video production team, tailor-made to fit your company's personality and its goals. As a result, customers can experience a level of professionalism from your company that they won't find from many others. Having a dynamic video can completely change your image in the mind of the customer from a faceless business in a sea of hundreds to one that is dedicated to standing out. Imagine the confidence this would give a potential customer in selecting you to handle his or her move! Do you have a special offer targeting a few geographical areas? Do you want to reach more customers and do more business? Coupons are the answer. Using our Coupons Section, moving companies can have the flexibility to come up with more creative promotions and increase the visibility of their business listings on Movers.com. To help them, we have an automatic coupon-generation engine, wherein you, the moving company, simply enter the offer/coupon details and we take care of the rest. Instead of having to contact your webmaster or get hold of someone to update your website every time you want a new promotion, you can put seasonal, weekly, even daily offers up on your Movers.com page as easily as you can imagine. Just a few clicks, and your promotions will be visible to your customers, who will see a dynamic company that saves them money, too. Movers.com has always been proud of and thankful to all the moving companies that have trusted us to help out with their business. At the same time, Movers.com also ensures that their customers don't fall prey to fraudulent moving companies. In order to combat the fraudsters, every moving company is run through a series of checks regarding licenses, and, once the company clears, only then is it accepted to advertise with Movers.com. When a moving company is a member with Movers.com, it is obvious that this company has been steady in the business, and, as a note of trust, each and every one is provided with our Seal of Approval. This seal will be given to you with a Java-embedding code that will allow you to place it on your own website. Customers who click on this symbol of quality will be immediately linked to your profile page on Movers.com. The various checks that we run are: MC#, USDOT# (Long Distance), Local Licenses, BBB Record, AMSA Check, FMCSA Approval Date, Physical Address, Contact Info, and others. When we partner with a company, we consider them a leader in the field, and we treat them that way. View the entire list of leads purchased by you, sorted by service type and date of insertion. Maintain a record of how many leads you have worked on. Coupons help you reach more customers and do more business. 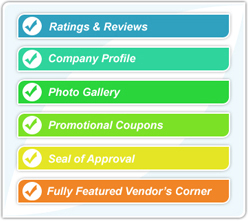 Our automatic coupon-generation engine is sure to help you in this regard. Be it your office, services, employees, etc.—anything that shows who you are. Let your customers and site visitors take a look at all your photos and see a professionally-made video, advertising your business in a dynamic way. While the compliments boost your profile, the complaints can be disappointing; use our unique system to tackle this issue with ease. From this welcome screen, you will have easy and simple access to the wealth of features available to you as a member of Movers.com. A new era for your business is only a few clicks away! Moving companies can view their complete company information, including: sales info, billing info, advertising info, etc. A simple click on the individual Area/Zip Code(s) shows the local address registered with Movers.com and the services you are advertising in those Area/Zip Code(s) with Movers.com. If you’re busy and don't have sufficient time to update your page faithfully, simply create more user accounts and allow your employees to work on the Vendor’s Corner. You, as the lead account holder, will have complete control over how much or how little access each account receives, allowing you to delegate responsibilities with ease and a sense of security. Take a glance at all the moving leads purchased by you. You can view them sorted by service type and date of insertion. We have also provided the additional options of viewing the leads summaries or all the leads placed on a map by area. View all past invoices raised on your name. Make a printout of these and file them for future reference while we store them for you online. Have you got an offer that you would like your customers to try? Use this section, which helps you to create all kinds of coupons and offers with remarkable ease. Jazz up your page on our website by adding pictures about the latest happenings around your office and business. You can upload a maximum of 10 photos, with each photo up to 2 MB or with a resolution of no more than 1024 x 768 pixels. Movers.com provides you the opportunity to receive, from us, a professionally-produced video to put on your profile page. Having a dynamic video can completely change your image in the mind of the customer from a faceless business in a sea of hundreds to one that is dedicated to standing out. Have an ear out for what your users have got to say about you via reviews and comments. Respond and interact with your users directly, and handle negative reviews with our enhanced "Reputation Management" system. What is your company’s logo? What are your payment methods? What are your hours of operation? How long have you been in the business? Answer these and a lot more FAQs of your customers by creating a stylish profile of your company on our website. On top of everything, we’re offering you a free “Moving Tip of the Day” gadget to put on your website, as well as a shopping cart widget for PackingMaterials.com. Any sales made through your domain will be worth up to a 15% commission for you; all you have to do is put it up there, and we’ll take care of the rest! As mentioned earlier, all of this is FREE! However, for a small fee, we are also offering exclusive leads to those companies that opt for them. This means that customers using your profile page on Movers.com will be put in direct contact with you, and only you, when they ask for a free quote.